Ipe (pronounced “ee-pay”) trees are dense hardwood trees indigenous to the rainforests of South America. The trees typically grow up to 120 feet and have trunks with diameters of up to 3 feet. These trees are most commonly used in decking applications by consumers who desire a deck that is both aesthetically pleasing and practical in its durability. Ipe wood is prized throughout the lumber industry due to its impressive density and hardness. To give you some insight into Ipe’s incredible hardness, on the Janka scale, which measures hardness among woods, Ipe ranks more than twice as hard as Hickory, 3 ½ times as hard as Teak, and over 10 times as hard as Cedar. For consumers, this hardness translates into remarkable natural resistance to rotting, warping, and insect damage. Therefore, Ipe is very popular in decking projects, as well as flooring, outdoor furniture, and other applications requiring a durable lumber. Even allowing for significant neglect and absolutely no treatment whatsoever, Ipe decks have been known to last over half a century. Also contributing to Ipe’s natural rot and insect resistance is the wood’s superior density. Ipe enjoys the same fire resistance as metal and concrete, meaning the wood is virtually fireproof, something any homeowner can appreciate. Ipe is so dense that when placed in water, instead of floating like most woods, it actually sinks quickly to the bottom. It is also the heaviest commercially available hardwood, weighing in at 66 pounds per cubic foot. As a comparison, Cedar’s weight is only 22 pounds per cubic foot, and Teak’s is 40 pounds. Even Oak, recognized as a very heavy and durable wood, cannot compare to Ipe, weighing only 43 pounds per cubic foot, a full 23 pounds less than Ipe. The lumber’s density also contributes to its resistance to warping and splintering, as well as being displaced once installed (via pulling loose, popping up, etc.). 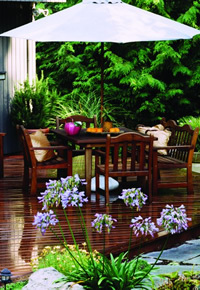 In addition to its prized durability and density, Ipe is also a very attractive wood. The lumber has a very tight grain, which results in very few knots among the boards, which contributes to consistency in appearance. Also contributing to consistency is Ipe’s coloring, which is a rich dark brown hue. Because Ipe boasts such a beautiful coloration, it does not require staining (or any of the time and expense inherent therein). With time and exposure to direct sunlight, however, Ipe can sometimes weather to a silvery gray hue. Although some consumers prefer this silvery gray color to Ipe’s original dark brown, sealing, while certainly not required, is recommended for those consumers who prefer younger Ipe’s dark brown coloration. 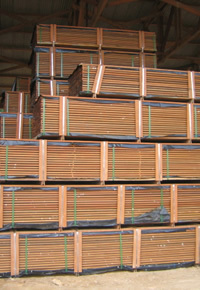 Ipe wood, like most woods, is known by a variety of names and comes available in a wide range of grades. The type of Ipe wood most prized among carpenters and other woodworkers is the Clear All Heart wood native to Northern Brazil. This type of Ipe is the darkest brown and has the tightest grain, although it is equal to all other types of Ipe in rot and insect resistance. Ipe’s other names include Ironwood, Pau Lope, Brazilian Walnut, Diamond Deck, and Tiger Deck. Most of these nicknames are derived directly from the lumber’s superior durability. For more information on Ipe or other types of wood for decking projects or other applications, contact the J. Gibson McIlvain Company today. With over 200 years of experience, McIlvain has the expertise to answer all of your lumber-related questions and provide you with the information you need to ensure that your project is a success. Visit us at www.mcilvain.com to learn more. Note: This article was written for J. Gibson McIlvain Company, an importer and wholesale supplier of exotic and domestic lumber.